One of the lessons I try to get across to students in my History of Medicine class at Ryerson is how to “read” images and assess their value as source–i.e what kind of implicit or explicit meanings are embodied in the images and what kinds of messages are being transmitted, as well as how clearly these messages are being received, and so forth. 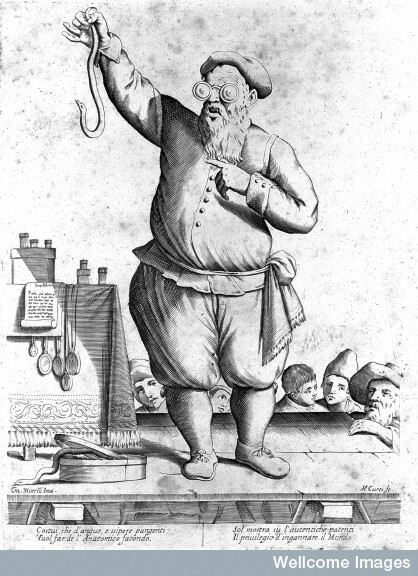 When we come across the topic of medical charlatanism in early modern Europe, I assign the students a small seminar assignment: go to Wellcome Images, and search through various images using the keywords “charlatan” or “quack.” There’s an incredible abundance of images that appear…and it’s always so fascinating listening to the depth of interpretations my students provide: the entertainment spectacle, showmanship, flamboyancy, brush of the exotic and foreign, obnoxiousness, and perhaps even annoying nature of these figures. 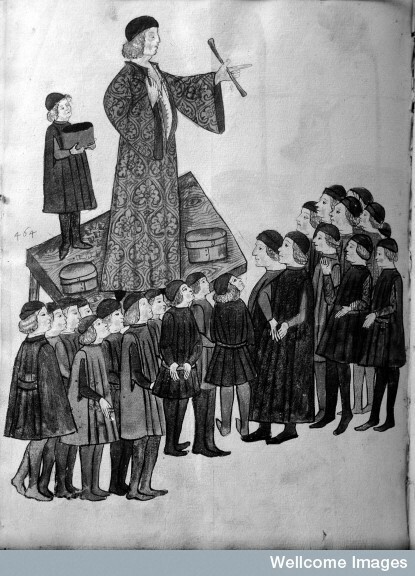 Charlatan with assistants, standing on table and addressing a crowd. 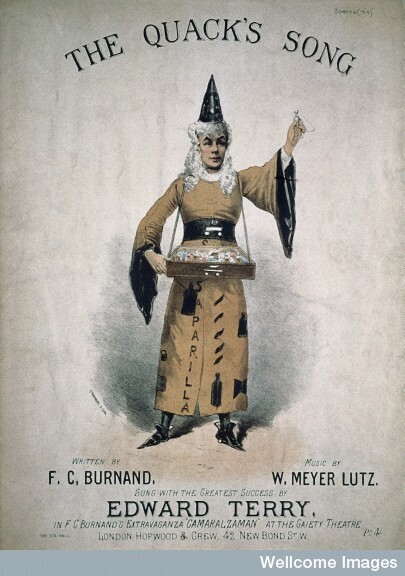 Lithographed song sheet cover: ‘The Quack’s Song’ composed by F. C. Burnand and W. Meyer Lutz. 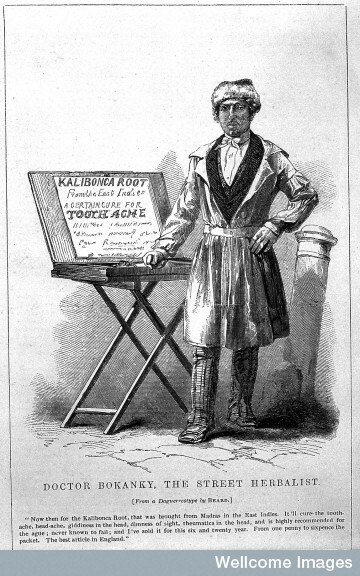 “Doctor Bokanky, street herbalist”: a quack selling a cure for tooth-ache in London, anon. after a daguerrotype by Beard. D. Gentilcore, Healers and Healing in Early Modern Italy (Manchester: Manchester University Press, 1998). D. Gentilcore, From Bishop to Witch: The System of the Sacred in Early Modern Terra d’Otarnto (Manchester: Manchester University Press, 1992). D. Gentilcore, Medical Charlatanism in Early Modern Italy (Oxford: Oxford University Press, 2006). L. Roper, Oedipus and the Devil: Witchcraft, Sexuality and Religion in Early Modern Europe (London: Routledge, 1994). K. Park, Doctors and Medicine in Early Renaissance Florence (Princeton: Princeton University Press, 1985). M. Pelling and C. Webster, “Medical Practitioners,” in C. Webster (ed. ), Health, Medicine, and Mortality in the Sixteenth Century (Cambridge: Cambridge University Press 1985), 165-236. G. Pomata, Contracting a Cure: Patients and Healers, and the Law in Early Modern Bologna (Baltimore: John Hopkins University Press, 1998). P.E. Pormann, “The Physician and the Other: Images of the Charlatan in Medieval Islam,” Bulletin of the History of Medicine 79 (2005): 189-227. Robert Ralley, “Medical Economies in Fifteenth Century England,” in Mark Jenner and Patrick Wallis (eds. ), Medicine and the Market in England and its Colonies, c.1450-1850 (New York: Palgrave Macmillian, 2007), pp.24-46. V. Nutton, “Healers in a Medical Market Place: Towards a Social History of Greco-Roman Medicine,” in A. Wear (ed. ), Medicine in Society (Cambridge: Cambridge University Press, 1992), 15-58.